"Cold Laser" - It just sounds intriguing, doesn't it? Also known as Low Level Light Therapy (LLLT), this modality has become very popular in sports injuries, and most professional athletic teams now use cold laser therapy. It is fast, safe, effective, and non invasive. This is an absolutely pain free therapy that can have dramatic results and speeds up the repair time of most injuries. It also works great for chronic conditions. It usually requires several treatments to notice a difference, and 10-12 doses are recommended for best results. We recommend treatments 2-3 times per week for 3-4 weeks. 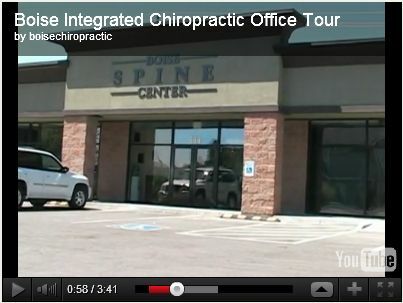 At Boise Integrated Chiropractic, we have invested in what we believe to be a superior laser - The MR4 by TerraQuant. It is a super pulsed laser, which means it can vary its target depth, unlike the other "pulsed" lasers that merely blink on and off for their pulse. 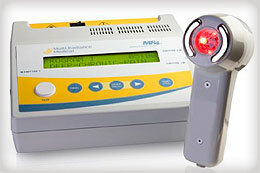 In addition, our laser has built in electrical stimulation, so it can be billed through insurance. Multi Radiance Technology™ is the first of its kind to combine the entire range of the therapeutic light spectrum and deliver therapeutic energy in a synergistic manner. The syncing of the therapeutic wavelengths creates an optimal environment that reinforces the effects of the individual wavelengths to create the world's most advanced pain relieving modality. The MR4 includes the patented LaserSweep technology which creates a constantly changing frequency to scan the selected target tissue from superficial to deep. This prevents biological adaptation to treatment for maximum impact.The MR4 excels where most laser devices fall short. It delivers higher peak power yet is safe without the risk of thermal damage found with class IV lasers. There are 4 treatment modes: preset programs for typical applications, LaserShower which allows a larger area to be treated, as well as manual and patient-specific programs. The patient-specific programs allow you to store up to 50 protocols for reoccurring patients. • Synergistic Effect of MRM therapy provides benefits of light therapy and neurostimulation, identifying optimal treatment sites, and provides highly targeted treatment where photons need to be delivered and electro-stimulation needs to be applied.